Australian trade surplus shrunk to 2,316M in October amid large imports of capital goods. AUD/USD trading near a fresh 3-week low of 0.7191, at risk of falling further. The AUD/USD pair fell to a 3-week low of 0.7191, immune to soft US data, which only brought some temporal relief, and strongly pressured by the sour tone of worldwide equities. Fears that the US and China won't come to an agreement about their trade relationship after the arrest of a Huawei executive dominated equities' markets, spurring demand for safety and sending government bond yields sharply down. The dollar came under pressure with such headlines, but not against its commodity-linked rivals, with the Aussie particularly hurt by fears of an economic slowdown in China and the CAD by falling oil prices, as an OPEC output cut remains unclear. Australian data released at the beginning of the day didn't help, as despite retail sales were up by 0.3% in October, the trade balance surplus for the same month was of 2,316M, well below the market's forecast. The country will release this Friday the AIG Performance of Construction index for November, previously at 46.4. 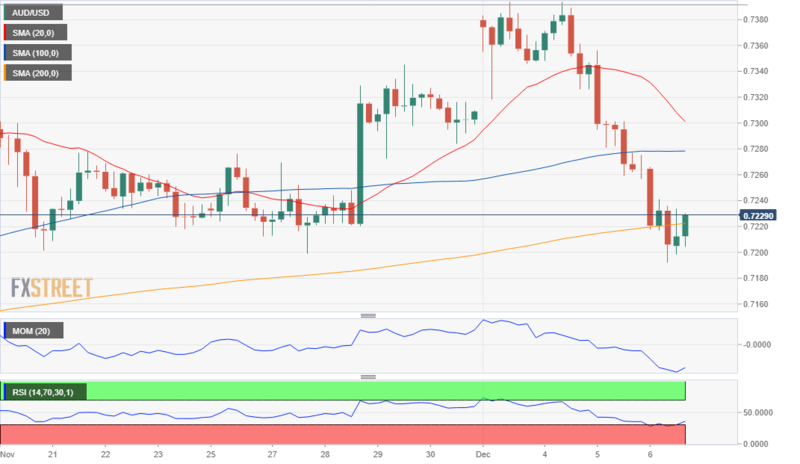 The 4 hours chart for the pair shows that it's battling with its 200 SMA after breaking below the 20 and 100 SMA, as technical indicators hold within oversold territory, with no signs of changing course. The pair turned bearish after breaking below the 0.7250 level and will remain so as long as below it. A strong support area comes around 0.7175, the level to breach for a steeper decline ahead. Above the mentioned 0.7250 level the pair could recover up to 0.7300, but gains below this last seem now unlikely during the upcoming sessions.